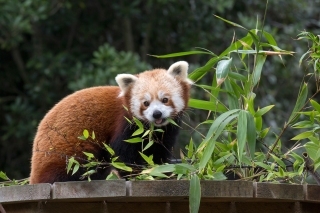 A live stream of the red panda enclosure at the San Francisco Zoo will be on display during Election Day (Nov. 7, 2016). A Berkeley-based nonprofit dedicated to the science of finding a meaningful life offered three tips of professional advice on how to deal with such a nasty election cycle. 1. Do something. “Do not fall prey to what compassion researchers call “psuedoinefficacy”—the sense that because you can’t do everything by yourself, that nothing you do matters,” she wrote. And while McGonigal didn't mention this specifically in her piece, the San Francisco Zoo offered its own de-stress techniques. Hours before the election the zoo streamed live footage of a red panda exhibit showing the cute creatures walking about their grassy home in a story that quickly became viral.